I'll admit it - I'm not a huge fan of plugins. I just don't have time for the learning curve of new software, and when I do make the time, I usually dedicate it to staying current with the big ticket items like Adobe CS4 and Maya. I also find it hard to justify the steep price tag of most commercial filters. Unless you are constantly looking for opportunities to use them, like a hammer in search of a nail, they take a long time to pay for themselves. And finally, most commercial plugins are focused on creating nifty effects rather than providing workflow improvements. Unfortunately most effects lose their novelty, and their value in your toolbox, pretty fast. In short, I don't dislike plugins, but I do approach them with caution. So when I was asked to review a plugin package containing nearly 200 filters, I was skeptical of its value. I figured I would be covering one or two of the "banner" effects, while ignoring the mass of throw-away effects typically included in large filter suites to bulk them up. 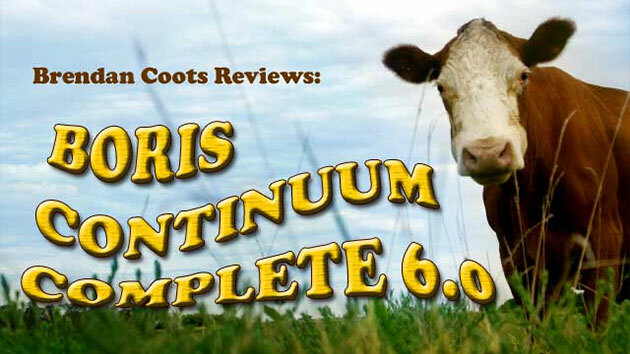 But Boris Continuum Complete 6 is different. So different, in fact, that it took me almost a full month to explore the suite for this review, with most of that time spent trying in vain to find flaws with the package. Most of the included filters cover everyday workflow needs from compositing to text animation to DV footage repair. In fact, each and every filter in this suite has a place in the busy motion graphics studio, and that is a rare accomplishment for a plugin package. When I first browsed the long list of plugins included with BCC 6, I assumed that Boris must have skimped on quality and features to include such a diverse list of complex tools. Surely they would feel like cheap toys rather than serious tools for production artists. But again, I was proven wrong. Each filter in this set is full featured, well thought out and delivered results that I wouldn't hesitate to put in front of my more demanding clients. BCC 6 filters come preloaded with a vast selection of presets, an amazing 3,500 in all. Unlike a lot of other plugins, I found the presets to be genuinely useful and reasonably in step with modern design standards. The presets alone really speak to the level of thought and detail put into BCC 6, as this is usually an afterthought for plugin developers. Every filter also includes a complete and at times overwhelming set of controls that allow you to fine tune every aspect of the effect. I found it quite easy to get the look I was going for, but I usually had to drill down pretty far into the menus to do so. I suppose that's the price you pay for ultimate control. In terms of overall quality, there is no question that this is a highly engineered package of plugins, and every BCC 6 filter is more than capable of going head to head with similar commercial plugins. While it would fill a novel to cover all of the filters included with BCC 6, I will touch on the 3D text and spline extrusion tools because they are so dynamic and useful. The 3D text tools feel very mature and full-featured, allowing complete control over the texture applied, the profile and depth of the bevel (using After Effects masks), lighting and more. Again, the mass of presets included make it very easy to get attractive results within a few seconds. A new feature with BCC 6 is that 3D text and spline extrusions can fully utilize your composition camera and lights, which makes for seamless integration of these 3D elements into the rest of your composition. You can also extrude After Effects masks into 3D beveled shapes with the same level of control you get with 3D text. I spent a lot of time playing with mask extrusions just because they are so cool, and the possibilities here are enormous. At the end of they day, the 3D tools in BCC 6 are almost worth the price of admission on their own, especially if you do a lot of text work. Beyond the 3D tools, BCC 6 includes a comprehensive selection of filters such as blurs, distortion effects, transitional effects, compositing tools (including wire removal and light wrap), volumetric lighting and other light effects, 3D shatters, snow and rain, film looks, motion tracking and video correction/repair filters. Reading over this list, one instantly thinks of all the expensive commercial filters that this package could and will replace, and it easily adds up to many thousands of dollars saved. For busy professionals, such a complete set of filters within one package means as you only have to learn one workflow to master just about every one of the 200 plugins, saving time on learning and implementation. It also takes a lot of pain and expense out of upgrades and support. Despite my best efforts to find bugs or other problems with BCC 6, I was hard pressed to find any over my month of use. I did find that certain camera moves, when BCC 3D extrusions were combined with After Effects 3D layers, resulted in some strange interpenetration issues, but they are easily corrected for. I also found that some 3D extrusions suffered from slightly aliased edges, but this didn't occur often enough to be a huge problem. Finally, I probably wouldn't get a lot of use from some of the OpenGL effects. Overall, I am definitely impressed with the broad utility of Boris Continuum Complete 6. This is hands-down the most complete and useful plugin suite I've ever used, and at $995 it's is an amazing value. As always, don't take my word for it -- Download the BCC 6 trial and give it a spin, I guarantee you won't be disappointed.